In 1908, Ernest Oates was a 32-year old Yorkshireman from the north of England who had been in Dallas only a couple of years when, missing the football matches of his youth, he decided to organize a “soccer” team in Dallas. The sport was virtually unknown in Texas, but because Oates undoubtedly knew everyone in the city who had made their way to the United States from England, Scotland, Ireland, and Wales, he had no trouble organizing a team of experienced players. After reports that the team had begun practicing at the Lake Cliff ballpark, there was news that another team was being formed in Dallas, this one to be coached by an apparently well-known American coach from St. Louis named William “King” Finnegan. This team seems to have had a harder time getting up and running (probably because Oates had snapped up all the good players). 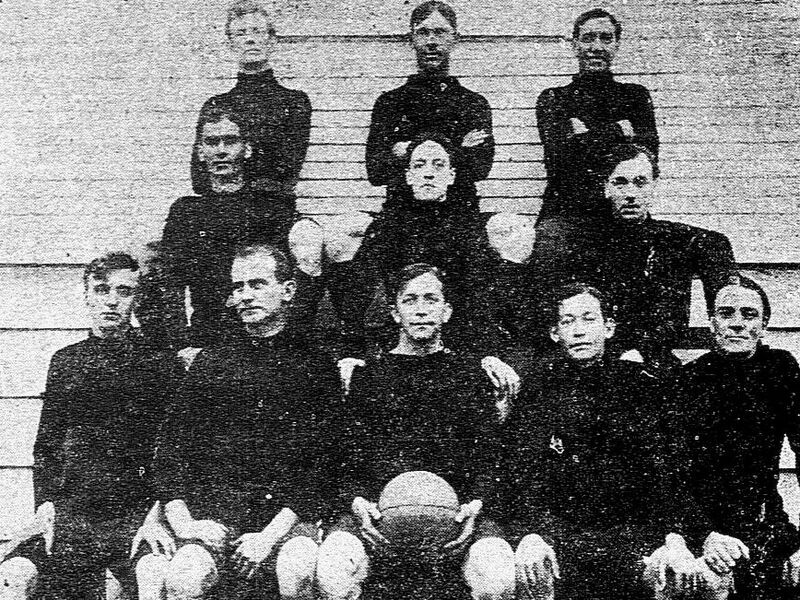 Even though they announced that they would be using Gaston Park as their home turf and practice would begin right away, it actually took them months to get a functioning team together. 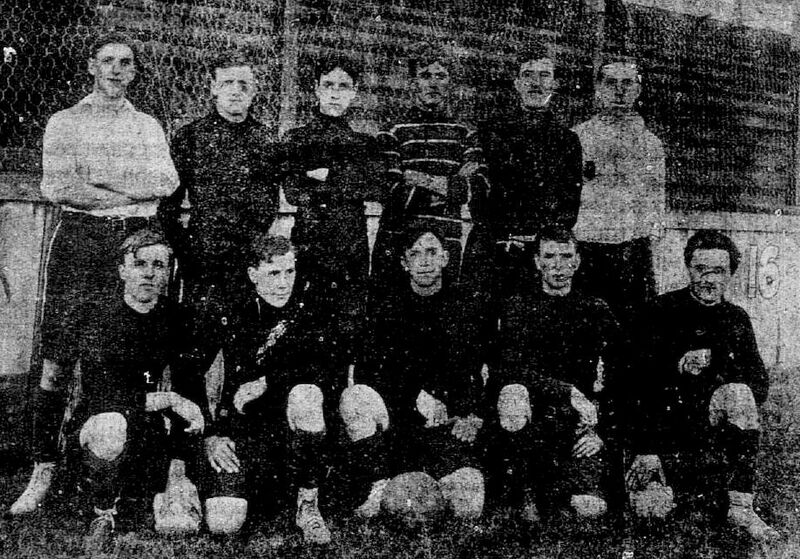 So there were really only two teams that played all of the soccer matches in that very short inaugural soccer season: the Dallas Athletics, led by Ernest Oates, and the Newspaper Association team, led by A. McKinnon. The newspapers tried valiantly to drum up excitement among local sports fans, and they ran lengthy explanations of the game’s rules in an attempt to educated their readers, but I’m not sure how successful they were at either attempt. Tellingly, attendance figures were never reported (except to say that British matches in the UK had no problem attracting crowds of 100,000 fans). The two teams played several games, and the Athletics usually won. After only four games, the two teams announced that they would have a “state championship” match on Christmas Day. They claimed that they were “the only two thoroughly organized soccer football teams in the state of Texas” — who else would they play in a fight for the championship? So they did. As expected, the Dallas Athletics won, 3-0. The “rugby football” team (which was also known as the Dallas Athletics) won their Christmas Day game as well, a fact that might help explain the cartoon below. “King” Finnegan (who, incidentally, had acted as referee for the championship game), disputed the whole “champion” thing, saying that his team, the Dallas Soccers, deserved a chance at the title (even though they had, thus far, played exactly zero games). The Athletics shrugged their shoulders and agreed to the challenge, and on New Year’s Day they trounced the Soccers, 6-0. And so ended the first soccer season in Dallas. Fort Worth did eventually join the fray the next season, but it wasn’t pretty — they were badly beaten in their first few meetings with the mighty Dallas Athletics. Sorry ’bout that, Fort Worth. Don’t mess with Ernest Oates. Here’s another photograph of Mr. Oates (front row, center) and the rest of his team. It’s been 106 years since soccer aficionados first started swearing that their sport will catch on in Dallas. And catch on big. And now you know when and where all that talk started: in 1908 with Ernest Oates and his Dallas Athletics. 1908 team photo by Clogenson, from The Dallas Morning News, Dec. 25, 1908; 1909 team photo from the DMN, Dec. 5, 1909. 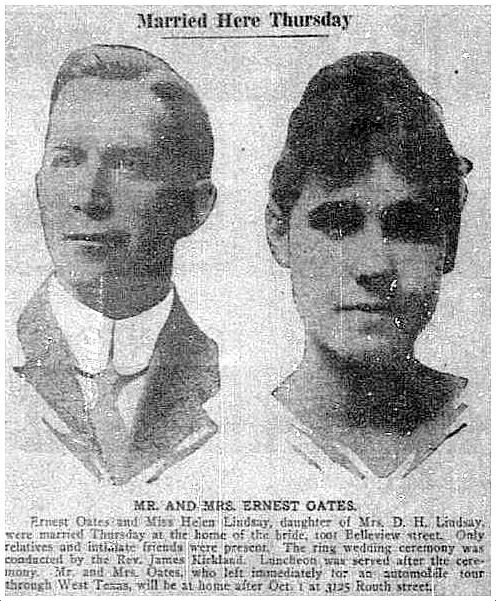 A photo of Ernest Oates and his new wife, the former Helen Lindsay in a wedding announcement (click for larger image). I’ve compiled a PDF containing most of the first few months’ news coverage of this whole new-fangled “soccer football” sport as it appeared in the pages of The Dallas Morning News and The Fort Worth Star-Telegram. I’m not much of a sports fan, but I actually found it very interesting to read chronological, contemporaneous reports of a new sport working its way into the city’s consciousness. I’ve left out the articles that explained AT LENGTH the rules of the game because my eyes (and soul) started glazing over. But the rest of it is here. My favorite headline is from an article about a mismatched game between Dallas and Fort Worth with the Fort Worth headline reading “Visitors Had More Experienced Men and Were in Better Condition” — yep, that’ll do it. There are a bunch of articles, stretching over a bunch of pages, but you might find them entertaining. The PDF can be found here. Click team photos for larger images. This is a great article! Thanks so much for posting it, and especially for the PDF. Just wanted to let you know that there is evidence of soccer in Dallas before 1908. Melvin Smith’s book on the early history of football lists a few soccer games played in Dallas in 1890-1891. The first I can find is a January 1, 1891 game played between the Dallas YMCA and Cole Select Military School (of Oak Cliff, apparently) – YMCA lost 0-3. “Dallas Association” tied the Oak Cliff Bankers 1-1 on February 23, 1891 at the Oak Cliff baseball grounds in front of 350 fans. Oak Cliff High School also played a 1-1 tie against Cole on February 28. It seemed that a lot of the references to “football” I came across concerned a rugby-style game played amongst the collegiate set. I couldn’t find any mention of “soccer” in Dallas earlier than the instances above, but there *were* mentions of the sport having been dabbled in, in previous years — maybe just not called “soccer”? Would it be fair to say that the teams in my post constituted the first serious attempt to organize as a league?